The Bunkycooks went on a bit of a different adventure this past weekend to spend some time with family in Madison, Wisconsin. We left town with no computer and were only equipped with an iPad, phones and cameras. We decided it was time to unwind a bit and just take in the local scenery and visit with my stepdaughter and her husband who are in graduate programs at The University of Wisconsin. How about some fried cheese in several flavors? It was awesome! 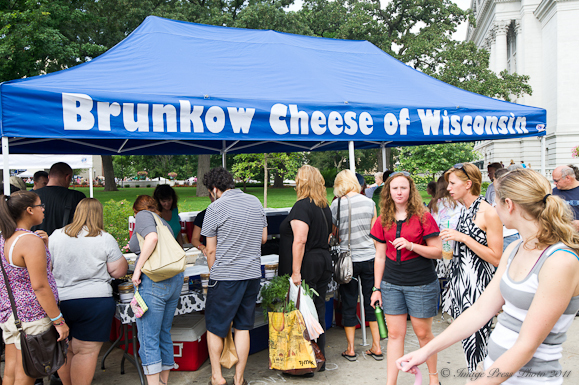 Of course, Wisconsin is also known for its beer and brats and we had our share of both of those along with the cheese. I will have several posts this week on the sights of Madison to share with you. We had such a great time and can’t wait to return. The weather was spectacular during our visit and a nice break from the 100 degree days we have experienced in Atlanta this summer. 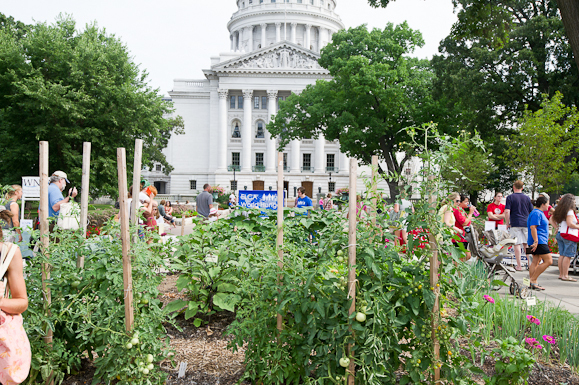 There is even a garden growing on the Capitol grounds! 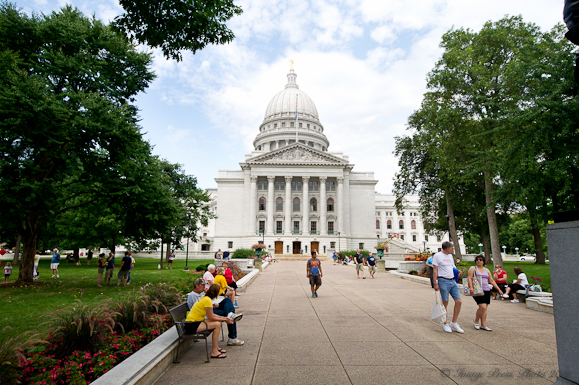 Madison, the capital of Wisconsin, is overflowing with lots of local color, beautiful farms and scenery, especially at the Dane County Farmer’s Market. 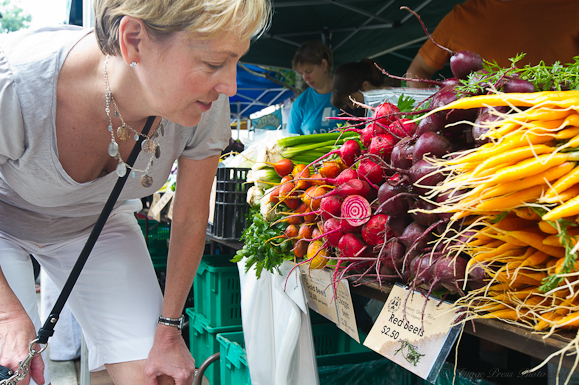 This Farmers Market is the largest producer-only Farmers’ Market in the country. It takes place every Saturday morning and wraps around the entire Capitol Square. Now, of course, you knew we had to go there! 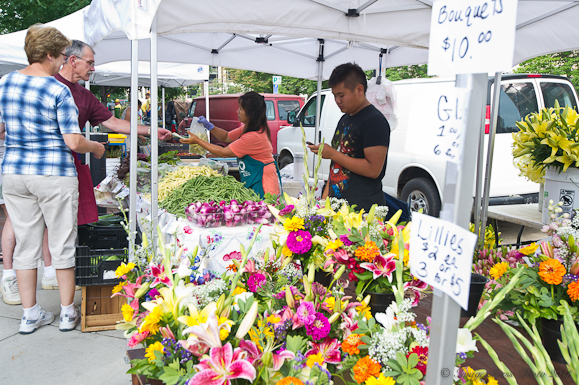 The market is year-round and will move indoors from November to April. Thousands of people show up every weekend, so you need to get there early if you are going to go and you most certainly should go if you are visiting the area. It was the most incredible market we have ever seen! Authentic Kettle Korn stirred and popped in a huge pot and served hot. Ward off vampires with all of this garlic! This hibiscus was just gorgeous. All the flowers were beautiful. The Heirloom tomatoes were at their peak during our visit. The beets and root veggies were all so colorful. The hats were pretty colorful, too. I confess to intense cherry envy!!! I also adore the pictures of the heirloom tomatoes and root vegetables: didn’t those turn out nicely! Glad you guys had a good time! 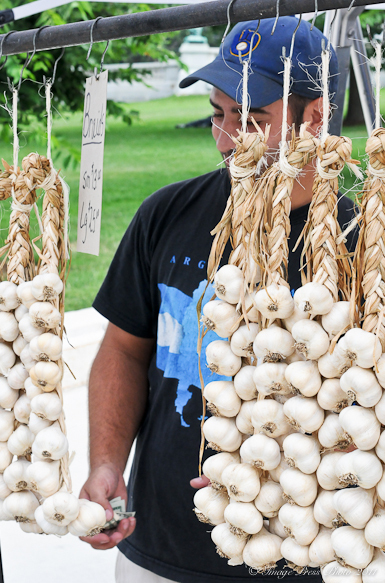 That looks like a wonderful Farmers’ Market -I need another garlic braid for my kitchen, but haven’t see those at our Market. And those jams, oyster mushroom, tomatoes, and sour cherries look gorgeous! 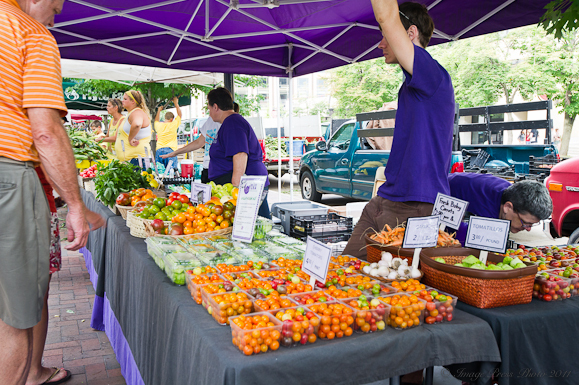 I’ll have some of our Farmers’ Market photos on my Concert post this week. I’m dying for some sour cherries, they make the best jam! When we did summer vacations in Michigan, I always brought back a couple of frozen bags. Unfortunately no one around here sees the point in growing them (I have a small Montmorency tree, but the birds beat me to it this year). Since you preserve so much–do yourself a favor and bring some back, they freeze beautifully and when you are ready to preserve them, they make the best jam or cherry pie filling. Am totally envious. Wow! These pictures are amazing. Wish I could have been at the Farmers Market! Great Job! You guys capture it all! Enjoy indeed! All of that bright color was especially needed on this dry Texas day. Thank you for sharing this market with me. This was perfect lunch-reading-material. I only wish I could have had a bite of some of those market goodies! I hope you have a lovely evening. I totally agree with everyone about the sour cherries. I brought some back to Texas from Michigan. I’ve already made pie and wish I had more. There’s nothing like great sweet corn. The corn looks incredible and super delicious. Wow this is so my kind of market! Gorgeous! 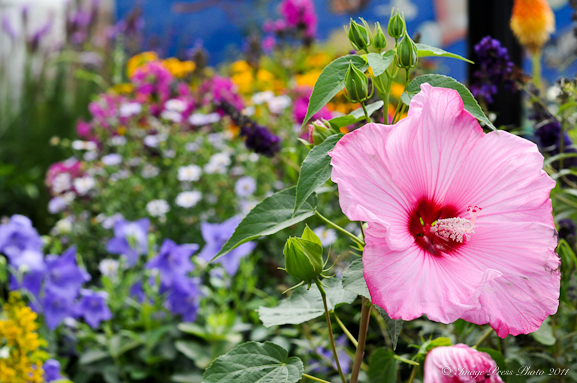 Beautiful weather and stunning products: I love the vibrant colors and the freshness of all the products. 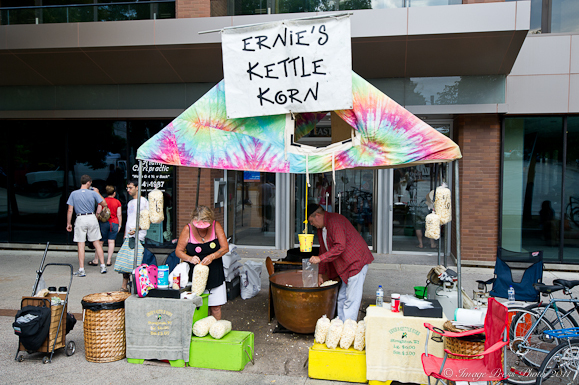 And freshmade kettle korn? This is the kind of place my husband and I would just spend the entire weekend if we could! The cherries, the jams, the cheese, it all looks amazing! Lucky you! How was the corn different than here in NC???? How fun did the Farmer’s Market look…? So happy for you! The corn was very good in Wisconsin, but much of it that we saw was yellow and there was the yellow and white (candy corn) variety. The white corn was not Silver Queen (as we have here in NC and I grew up on in PA) and the kernels were much smaller. That is what I noticed at the Farmer’s Market. I am sure there are many varieties of corn grown in that area since we saw a large number of corn fields (as you would expect in the Midwest). Those beautiful photos just made you feel like running to the nearest farmer’s market and start cooking up a storm! 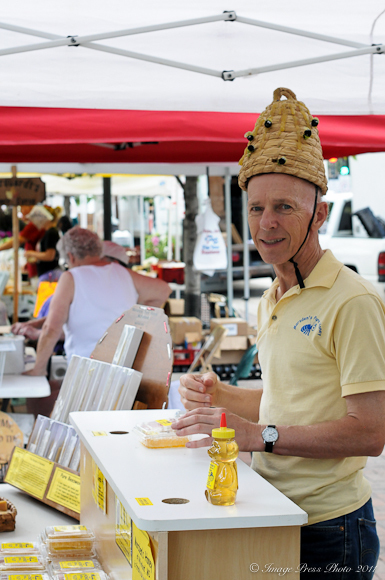 I’ve never been to Wisconsin but if you can buy bee hive hats there, it’s definitely on the list!